This recipe was featured in Mother Earth News - where you can find the full story, info and recipe alterations. 1. Heat the water to just a little warmer than body temperature (about 100 degrees Fahrenheit). 2. Add yeast and salt to the water in a 5-quart bowl or, preferably, in a resealable, lidded container (not airtight — use container with gasket or lift a corner). Don’t worry about getting it all to dissolve. 3. Mix in the flour by gently scooping it up, then leveling the top of the measuring cup with a knife; don’t pat down. Mix with a wooden spoon, a high-capacity food processor with dough attachment, or a heavy-duty stand mixer with dough hook, until uniformly moist. If hand-mixing becomes too difficult, use very wet hands to press it together. Don’t knead! This step is done in a matter of minutes, and yields a wet dough loose enough to conform to the container. 4. Cover loosely. Do not use screw-topped jars, which could explode from trapped gases. Allow the mixture to rise at room temperature until it begins to collapse (or at least flatten on top), approximately two hours, depending on temperature. Longer rising times, up to about five hours, will not harm the result. You can use a portion of the dough any time after this period. Refrigerated wet dough is less sticky and easier to work with than room-temperature dough. We recommend refrigerating the dough at least three hours before shaping a loaf. And relax! You don’t need to monitor doubling or tripling of volume as in traditional recipes. Refrigerate unused dough in your lidded (not airtight) container and use it over the next two weeks: You’ll find that even one day’s storage improves the flavor and texture of your bread. This maturation continues over the two-week period. Cut off and shape loaves as you need them. The dough can also be frozen in 1-pound portions in an airtight container and defrosted overnight in the refrigerator prior to baking day. 1, Prepare a pizza peel by sprinkling it liberally with cornmeal to prevent the loaf from sticking to it when you slide it into the oven. Sprinkle the surface of the dough with flour, then cut off a 1-pound (grapefruit-sized) piece with a serrated knife. Hold the mass of dough in your hands and add a little more flour as needed so it won’t stick to your hands. Gently stretch the surface of the dough around to the bottom on four “sides,” rotating the ball a quarter-turn as you go, until the bottom is a collection of four bunched ends. Most of the dusting flour will fall off; it doesn’t need to be incorporated. The bottom of the loaf will flatten out during resting and baking. 2. Place the ball on the pizza peel. Let it rest uncovered for about 40 minutes. Depending on the dough’s age, you may see little rise during this period; more rising will occur during baking. 3. Twenty minutes before baking, preheat oven to 450 degrees with a baking stone on the middle rack. Place an empty broiler tray for holding water on another shelf. 5. With a forward jerking motion of the wrist, slide the loaf off the pizza peel and onto the baking stone. Quickly but carefully pour about a cup of hot water into the broiler tray and close the oven door to trap the steam. Bake for about 30 minutes, or until the crust is browned and firm to the touch. With wet dough, there’s little risk of drying out the interior, despite the dark crust. When you remove the loaf from the oven, it will audibly crackle, or “sing,” when initially exposed to room temperature air. Allow to cool completely, preferably on a wire rack, for best flavor, texture and slicing. The perfect crust may initially soften, but will firm up again when cooled. Slice zucchini into half-moons about ½ inch thick. Peel and slice eggplant to similar size. Place in mixing bowl and toss with salt. Let stand for 30 minutes. Pat dry with paper towel and set on plate. Heat oil in a large skillet. In one layer at a time, briefly sauté the eggplant and zucchini (about a minute on each side – slightly browning). Remove to side dish. In the same skillet, cook onions and peppers slowly in the olive oil for about 10 min.s, or until tender, but not brown. (To peel tomatoes: dip tomatoes into boiling water – 10 seconds, max. ; then peel. Seed by cutting horizontally and either gently squeezing or scooping out the seeds into a bowl.) Slice peeled & sliced tomatoes into pieces the same size as the zucchini and eggplant. Lay these over the onions and peppers. Salt with salt and pepper. Cover the skillet and cool over low heat for 5 minutes, or until tomatoes begin to render their juice. Uncover, baste the tomatoes with the juices, raise the heat and boil for several minutes, until juice has almost evaporated. Scoop half the tomato/onion mixture out or to side of skillet. Spread the remaining half over the bottom of the skillet. Lay half the eggplant and zucchini on the tomatoes and onions. Return the other half of the tomato/onion mixture to the skillet. Put the rest of the eggplant and zucchini on top. Cover the skillet and simmer over low heat for 10 minutes. Uncover, tip skillet and baste with rendered juices. Correct seasonings, if necessary. Raise heat slightly and cook uncovered for about 15 minutes more, basting several times, until juices have evaporated leaving a spoonful or two of flavorful olive oil. Don’t let vegetables scorch in bottom of skillet! This is an original recipe by yours truly, but that is just a way of saying "made up". It is quite good (as attested to by my whole family) and easy to make. Drain each block of tofu by slicing it in half lengthwise and placing the two halves on paper towels. Place another paper towel on top and gently press down. Let the tofu sit on the paper towels while you prepare the broccoli. Trim the broccoli into medium-sized florets (bite size). Include some of the stem, too (trim off the tough outer growth). Heat some oil (enough to coat the pan well, about 1-2 T) in your saute pan. Add the broccoli and cook for a few minutes until it starts to turn bright green. Drizzle a good amount (1/4 c or so) of peanut sauce on top. Stir to coat and continue cooking until just tender, but still with a good firmness. Transfer the cooked broccoli to the casserole dish, drizzle a bit more peanut sauce on top, cover with foil and place in warm oven. Back to the tofu. Change the paper towels and press out the last of the water from your tofu. Dice tofu into bite-sized pieces (about 1/2 inch square). Heat more oil in pan (enough to coat the pan well, like before). Add tofu and cook for 2 minutes, turning gently. Drizzle a good amount of peanut sauce on top and continue cooking until tofu is well-warmed. Keep an eye on it as the peanut sauce can start to burn at this point. Place cooked tofu over broccoli, drizzle more peanut sauce over top and serve over the cooked rice. You can also recover it at this point and keep it in a warm oven until ready to serve. I don't think I'd leave it for more than an hour - the broccoli might get too limp. This only takes a few minutes to cook - 30 minutes from start to finish (not including the rice cooking time, which might take longer depending on what type of rice you make). Wow - who knew fasting could turn up such GREAT meals?! This is one of those - it is so easy to make and is really delicious. The entire family loved it: hubby, teen son, two youngers and even the toddler! If you are keeping a strict fast, this is quite good without the milk and butter...but with those it has a deeper, richer flavor. In a heavy-bottomed soup pot, combine the potatoes, leeks, water and salt. Simmer, partially covered, for 40-50 minutes until vegetables are tender. Mash vegetables with fork, run through food mill, or use a hand blender. Taste and correct seasoning as needed. (If using dried herbs, add now so they can soften up). You can now cover and set it aside until just before serving - just reheat to gentle simmer if necessary. Once reheated (or if still hot, when ready to serve), stir in milk, cream or butter. Stir in herbs and serve with a lovely crusty bread. 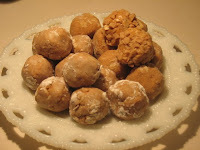 I was trying to find an easy recipe for peanut butter balls, but most of them had dry milk as an ingredient. I really needed a recipe without that milk. But didn't have much luck, so I came up with this one. I'm sitting here staring at a plate of them right now.... Can't wait until dessert time! These also make great afternoon snacks for really hungry kids. Put all ingredients in a mixing bowl and combine to form a dough. This is a tough dough to mix, but just keep at it and it will get all incorporated. If your is still too wet (dough is not coming together into a dough ball - pulling away from the sides of the bowl), add more of the sugar, oatmeal, and/or wheat germ (to your preference or taste - all three are helpful for "drying out" the peanut butter. I added the honey because I like the flavor it adds to the peanut butter. You may need more or less sugar depending on the sweetness of your peanut butter. I used natural peanut butter and needed closer to 1/3 cup. Once you get a nice dough ball, use a spoon to scoop and form approximately 1 inch balls, rolling them in your palms to get a nice even shape. Roll the balls in powdered sugar or anything you like. Maybe mini-chocolate chips? Yum! I used some Heath Bar bits I had in the pantry - delicious! Did you enjoy this post? Subscribe via email or RSS. A nice breakfast or snack (or dessert). Blend sugar and oil together. Add pumpkin and applesauce, then dry ingredients. Mix in nuts and raisins. Bake at 350 degrees for 1 hour. Makes 3 loaves. Blend all ingredients in a blender until smooth. Add honey for sweetness if needed (depends on the sweetness of your peanut butter). This recipe is from Marcella Hazan's Essentials of Classic Italian Cooking, one of my favorite cook books. :: Saute garlic in pan large enough to accommodate all the ingredients in the olive oil and over a medium heat. Cook until a light nut brown, then remove from pan. :: Add the crushed rosemary or fresh spring, stir, then put in cut up tomatoes and their juice. Cook for 20-25 minutes (or until oil floats free from the tomatoes). :: Add the drained chick peas and cook for 5 minutes, stirring them thoroughly with the juices in the pan. :: Add the broth, cover, and adjust heat to that the soup bubbles at a stead but moderate boil for 15 minutes. :: Taste and correct for salt. Add a few grindings of pepper. Let the soup bubble uncovered for another minute, then serve promptly. To this I may add some cooked rice or just serve it with a good loaf of bread. We have a very large fig bush, actually, a tree, I guess! It is in its 4th year and looks to be our best harvest, yet. So, here's the first recipe I'm trying with this year's harvest. I found this recipe at Burp! Where Food Happens, but changed it just a little bit (added vanilla). Cut figs into quarters or eighths. Cook figs in water and zest for 8-10 minutes or until figs are tender. Add sugar and cook until jam-like (took about 20 minutes or so, stirring frequently). Let cool. Blend in cream, lemon juice and vanilla (use a handmixer if you have one, if not a quick whirl in the blender). Chill well (overnight, if possible - otherwise for a few hours). Pour into you ice cream maker and follow manufacturer's directions. Oh, my goodness it is absolutely heavenly! As you might have noticed from my post frequency, May is a ridiculously busy time in my family! End of school, summer plans being formed, son's birthday party, and state homeschool convention. Well, here's what we are having for dinner tonight. It is simmering away on the stove right now! At the same time, in a medium saucepan, heat oil over medium heat. Add onion and saute until just soft, add carrots and saute a few minutes more. Add garlic powder, rosemary, bay leaf, and red pepper flakes. Add 2 cups of water, tomatoes, carrot, and garbanzo beans, reserving 1 cup whole beans. Bring to a boil, stiffing occasionally, then reduce heat, cover and simmer for 7-10 minutes. Puree vegetables (in blender or with a hand blender) and return to saucepan. Add pasta and remaining whole beans and heat through adding water if soup is too thick. Top with cheese at the table! 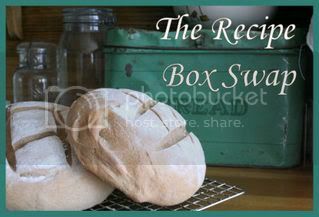 Today is Randi's Recipe Swapbox for May. Don't miss it! I submitted the recipes for Green Tomato Casserole and Good Season-ish Dressing Mix. Do you love Good Season's Italian Dressing Mix as much as I do? Do you hate the preservatives and other chemicals they include as much as I do? Would you love a dry mix you can make yourself and keep on hand? Look no futher! Welcome to the Farmer's Market Report! Lovely red french lettuce, turnips, carrots, baby bok choy, radishes, and eggs - these were all the wonderful things I brought home this week. Missed the strawberries, but there are local stands all over the backroads of my NC county, so I'll pick those up later this week. I'm planing a batch of strawberry ice cream! Be sure to come back and visit later this week as I add recipes for Salad Dressing Mix, Roasted Carrots and Brussels Sprouts, Baby Bok Choy with Oyster Sauce, and Turnips Au Gratin. The market has really picked up steam in the last week...the produce is coming in thick and so are the shoppers! After my farmer's market run, I had to swing by the conventional grocery to get milk. Such a stark difference! The first thing I noticed was the smell - mostly refrigerant, but with some wafts of vegetables from the produce section and warm bread from the bakery. But nothing like the earthy, warm, rich fragrances from the onions, herbs, etc at the farmer's market. Then there were the shoppers. The shoppers at the farmer's market was comprised of some singles, but also lots of couples and families. At the conventional grocery, on the other hand, there were only lone shoppers - no couples, no families. Now, I know that couples and families do shop together at conventional groceries, but it the difference that morning highlighted how different the two are. The farmer's market is very community-oriented and can be a delightful family outing, unlike the conventional grocery. So, how was your farmer's market this week? Can't wait to read about your visit to the farmer's market! Please be sure to read and follow the guidelines before submitting your post. Thanks! This recipe was my first real adventure with kale. I always thought I didn't like kale, but I was wrong! I was inspired by a traditional Portuguese soup with kale and beans (and sausage) which sounds wonderful, but this one uses up my leftover chicken! This dish is great for many seasons: late fall, winter or early spring whenever kale is available in your area. Heat olive oil in a large soup pot or dutch oven. Add onion and saute until transluscent. Add stock and bring to boiling. Add kale by handfuls (allow to wilt a bit and then add the next handful), stirring well. Let kale boil for a few minutes to soften well, then reduce heat and add beans and liquid from can. Cover and simmer until kale is tender. Add cooked chicken and keep soup simmering to warm chicken through. You can toss in a rind of parmesan into the pot for extra flavor or top with freshly grated parmesan at the table. Serve with a nice crusty bread! Did you enjoy this recipe? Subscribe via email or RSS. Radishes, Kale, Turnips, Spring Onions...and some greenhouse Tomatoes - we brought home a nice bag full. Did you find similar things at your market? I've got some ideas for using these, do you? On our way to the market, we have been stopping by our local coffee shop. It is a great way to break large bills into smaller ones, and who doesn't need caffeine at 7:30 on Saturday morning? Then we walked the block or two down to the market. We had a heads up that the "Tomato Guy" had his first crop of greenhouse-grown tomatoes. I debated purchasing these because it is most definitely NOT tomato season...but they are local and they are GOOD. So, I caved and we brought home two lovely red ones and a nice fat green one. He was down to his last box (there was a line to get tomatoes!) by the time we left at 8:00. The market was much busier today than last week and the farmers seemed to have a bit more produce. Some recipes I plan to try this week (and blog about): Green Tomato Casserole, Scandinavian Radish Salad, Kale & White Bean Soup, Roasted Potatoes and Turnips, and a Spring Onion Quiche. Be sure to check back for those recipes! Here's a question: Do you have a favorite farmer from whom you purchase most of your produce, or do you purchase a little from a number of different farmers? I feel a little obligated to make purchases from a number of different farmers, but I do have my favorites. I usually buy the most from them. How about you? What makes a farmer a favorite for you? Can't wait to read about your visit to the farmer's market! Please be sure to read and follow the guidelines before submitting your post. Thanks! Don't miss future Farmer's Market Reports! Subscribe via email or RSS. Are you a Farmer's Market Reporter? Grab this button and display it on your blog! A Ten O'Clock Scholar - home education, anglicanism, art, etc.